Will SYRIZA save us from the clutches of “European” capitalism? As expected, on 29 December, the Athens Stock Exchange greeted the prospect of a January 25 general election with a drop of 4%, to add to 9 December’s fall, when it lost 12.7 %, dragging down other European exchanges with it. This was due to the failure of the Greek government to get its candidate elected to the presidency of the Republic in the dying days of 2014. Under the Constitution, there is now no other option but early parliamentary elections. What has created anxiety and apprehension in the "markets" is the very real possibility that SYRIZA, the radical left (?) party, will win a majority and then get the job of forming the next government. Polls give it 27% of the votes although there has been a slight decline lately, so it seems that New Democracy, the centre-right party of current prime minister Samaras, has some hope of a comeback, if not a sensational surprise. Of course, the campaign of "media scaremongering" against SYRIZA and its leader, Alexis Tsipras, has already started. He is accused of trying to undermine the sacrifices made by the Greek people, thus pushing the country back into chaos, because of a political-economic agenda hostile to Europe and the "markets". Even Juncker, President of the European Commission, addressed the Greek electorate inviting them to vote with “a sense of responsibility”, that is, against Tsipras. But is his programme really so frightening? Can it really bring down the European Union framework, or even capitalism itself in the old continent? Before answering that, it is useful to take a step back to get a broader picture. As everyone knows, Greece was considered a flagship of European "neo-liberalism". The Athens Olympic Games were thus seen as a real celebration of the secular prosperity which complete commitment to the religion of "markets" had brought to the country. This seemed OK (so to speak) until the subprime crisis revealed the flaws of an economic "development" founded mostly on debt, financial speculation (and greater exploitation of the workforce), in the hope that, after all, money could create more money (as Hitler's Finance Minister, Hjalmar Schacht once put it) missing out the process of production we call the real economy. Let’s be clear, this is general to the capitalist system today, but in some countries (so far ...), the paralysis of the mechanism has been particularly dramatic due to their particular circumstances. Dramatic consequences but not for everyone, of course, "only" for the vast majority of the population: the proletariat, the world of work, part of the petty, and even middling, bourgeoisie, made up of small entrepreneurs, and those a little less small, who have gone bankrupt or are on the verge of insolvency. Today, half of the companies with less than fifty employees run the risk of closing (Il Fatto Quotidiano, 23 April 2014), ruined by falling sales, and the amounts owed in tax and to the banks. But if some sectors of the bourgeoisie, those at the lower end of its hierarchy, have little to laugh about, the proletariat has wept rivers of tears. From 2008 to present, the official statistics reveal nothing less than a dramatic fall in living standards. In exchange for aid to prevent default, and the collapse of the country, the infamous troika - the EU, ECB and IMF - has forced the government into an austerity policy (Memorandum) that has spread misery, pain and tears. Cuts – ranging from direct ones such as butchering wages, to indirect and deferred ones (the welfare state), have led to the reduction of the consumption capacity of the broad masses, which in turn, has caused or accelerated the crisis and the closure of many businesses (from workshops to factories). GDP fell by 25%, unemployment is at 27% (57% for young people), for many workers, wages - what little they get - are paid months (up to one year) late or even in kind via food and supermarket vouchers. Increasingly, school personnel record cases of malnutrition among school children, which they try to deal with through collections. In addition there is an increase in serious diseases and suicides. Here the intimately criminal and crime-producing nature of capitalism almost shows itself, you could say, at its best: so much suffering, so much despair at the Troika’s notorious conditions for granting aid – at least 240 billion euro – in order to keep European (mainly French and German) financial capital afloat. Since then capital has become a serial killer. This December alone it has made additional "aid" of 2.5 billion (to the same recipients) conditional on a rise in VAT and the retirement age. In short, it’s still the same old story. Come on, say the bourgeoisie, we must not make a drama over which "delinquent" is putting sand in the carburettor and sabotaging the motor of recovery. Some children had to give up their snacks, a grandparent may have died, (sorry, but they should really have died earlier), we may also have sold off the family silver (islands, airports, various infrastructures), to Chinese, Saudi etc capital but the recovery has now begun: the balance of payments recorded a surplus in 2013 of 1.24 billion even if in the meantime debt reached 175% of GDP. However, we are getting a glimpse of the famous light at the end of the tunnel. Now, the current huge devaluation of capital may have borne some fruit (only and exclusively for capital itself) as a result of the tourist boom (in which the immiseration and then the blackmail of the wage-earning class is a fundamental component), but from there to argue that the Greek economy has put its difficulties behind it is going too far. The real problem for Greek capitalism is the same as for European and international capitalism: a rate of profit that will not return to sufficiently high levels given the current organic composition, or allow the level of investment which is needed to really generate a new cycle of global accumulation. In this scenario SYRIZA has gained momentum, raising great expectations in wide sectors of the impoverished and deprived population. In a few years, this party has gone (it seems) from 4.5% to 27% in the opinion polls by virtue of its opposition to austerity policies. In fact, its programme entails the rejection of the EU Memorandum, the raising of the minimum wage and pensions (the amount, not age), and a cut of 70-80% in the national debt. It does not put forward an anti-European perspective at all nor does it want out of the euro – as many mistakenly say – but wants "only" a change in direction in a "social" and ecological European Union. 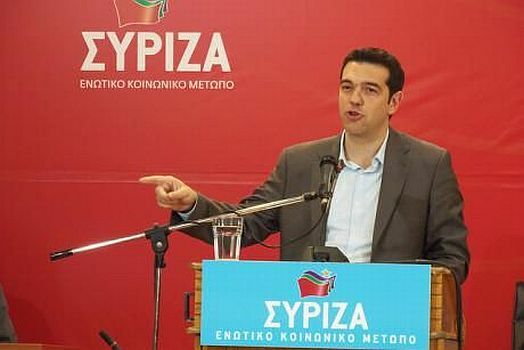 Tsipras obviously knows that these objectives are not welcomed in Frankfurt, Brussels and Strasbourg, and while on the one hand he leaves a possible exit from the euro on the table – as a last card should all else fail – to keep his opponents guessing, on the other he sends a delegation to the City of London, one of the temples of financial parasitism, to show his respectability. Leaving aside the fact that a really anti-capitalist (i.e. revolutionary) political formation would never "take tea" with the bankers of the City, they would certainly invite SYRIZA, if it really wanted to carry out its programme, to hit a brick wall: that of European capitalism and its institutions. For this to be even dented, let alone brought down, SYRIZA will need many other tools. It is not just a measure – although a very important one, like the Memorandum – that has to be demolished, but the entire European political-institutional structure which has to be dismantled. Still more: it is capitalism itself, with needs produced by this specific phase of its existence, a capitalism which that European political structure expresses, which must be attacked and destroyed. To quote one of the many problems that Tsipras will face, where would he find the money needed to create a European "New Deal"? Remaining in a bourgeois framework, he could impose a highly progressive wealth tax, but this would drive away foreign capital and, in general, provoke strong tensions within the "national" bourgeoisie itself. Juncker’s warning/threat has to be understood in this sense. SYRIZA would, then, have to perform a political somersault, denouncing en bloc the debt and the entire economic and political structure of the EU, calling on the Greek proletariat for a general mobilisation against the system as a whole, and appealing to the European proletariat (resident in Europe) so that they act in the same way against their own bourgeoisie. To respond adequately to Schauble, German Economy Minister (who has warned against both a partial and unilateral debt default), Tsipras could call to arms the German working class, beginning with those fourteen million workers who end up stuck between mini-jobs and working for less than six Euros per hour. But ... but we are not dreamers – that is, not in the worst sense of the term – and we know that SYRIZA will not go that far, despite the pathetic complaints of Trotskyists members of this political formation – such is the (im)potence of Trotskyist entryism! If Tsipras gets into the government, either alone or in coalition, at best he will carry out a few cosmetic measures, a few tweaks here and there, but, will respect the fundamental rules of capital, will not push things, and will not be able to get very far. For once, we agree with the Italian employers’ mouthpiece, which wrote about SYRIZA, that "we are not talking about managing the age of income distribution, but that of the austerity and sacrifices" (V. Da Rold, Il Sole 24 Ore, 10 December 2014). True, but whilst for the bourgeoisie, that means that the proletariat must resign itself and submit meekly to an order they consider natural, for us it is proof that the proletariat must not, and cannot, expect anything from reformism, except tired old illusions. We therefore have no choice but to break with a social order that is the work of men, and therefore like all things human, can be changed for another, different and better society.